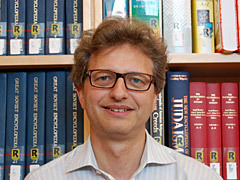 Michael Brenner, Chair of Jewish History and Culture at the University of Munich is the author of many volumes in Jewish history, including contributions to the Leo Baeck Institute four-volume German Jewish History in Modern Times (Columbia University Press 1997-98). Prophets of the Past is his most recent publication (Princeton University Press, 2010). Prophets of the Past is the first book to examine in depth how modern Jewish historians have interpreted Jewish history. Michael Brenner reveals that perhaps no other national or religious group has used their shared history for so many different ideological and political purposes as the Jews. He deftly traces the master narratives of Jewish history from the beginnings of the scholarly study of Jews and Judaism in nineteenth-century Germany; to eastern European approaches by Simon Dubnow, the interwar school of Polish-Jewish historians, and the short-lived efforts of Soviet-Jewish historians; to the work of British and American scholars such as Cecil Roth and Salo Baron; and to Zionist and post-Zionist interpretations of Jewish history. He also unravels the distortions of Jewish history writing, including antisemitic Nazi research into the “Jewish question,” the Soviet portrayal of Jewish history as class struggle, and Orthodox Jewish interpretations of history as divinely inspired. History proved to be a uniquely powerful weapon for modern Jewish scholars during a period when they had no nation or army to fight for their ideological and political objectives, whether the goal was Jewish emancipation, diasporic autonomy, or the creation of a Jewish state. As Brenner demonstrates in this illuminating and incisive book, these historians often found legitimacy for these struggles in the Jewish past.